Summary: A dark and twisted take on some classic fairy-tale characters, Keith Austin’s brand-new novel will have you on the edge of your seat as you find out if there really is such a thing as Happy Ever After . 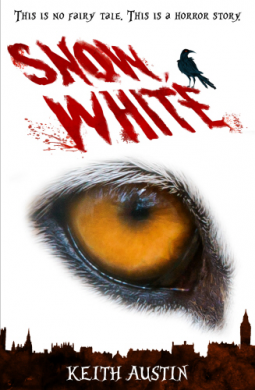 . .
John Creed’s nights are haunted by dreams of a white wolf, his days by the hideous class bully. He’s a loner with a stutter and his home-life – with an eccentric grandfather who wants to teach him folklore and ancient languages – is isolated and unusual. But then John makes a friend – Fyre. She’s as unusual as John and has her own secrets to keep, but as the truth about John’s past starts to emerge, she’s the best ally he’s got . . . Thank you to Random House UK and NetGalley for the early copy. People who have read this blog will know just how much i love a fairy-tale retelling, so given the opportunity to review this book, i jumped at it. The book opens to a particularly twisted and descriptive prologue, about Mum, the wolf and… the son. Austin successfully integrates a Red Riding Hood theme, that is both shocking and well written. This is where we meet the white wolf of John’s dreams, her muzzle covered in the blood the son. Austin then moves into the story, introducing us too the three children. John who is a shy, stuttering boy who has long scars running down his face. He is doubly insecure because of this and doesn’t have any friends. We then have Fyre, an Albino who understands John’s insecurities who wants to be friends. Then we have Casper, the class bully who doesn’t understand how Fyre can no longer like him. He has ADHD but has rebelled and has stopped taking his medication. The way Austin introduces each of them is both reflective of their individual personalities and gives the reader an insight to each of their problems. For me, this is a breath of fresh air and a difference to how many different characters are introduced in a book, saying that the book being narrated in third person led to a lot of disorientation when reading with the narrating character always shifting. This left me with a lot of confusion and loss in enjoyment of the book as i struggled to decipher who it was now centered on. It does pick up a bit later within the book, introducing a dash of blood. This helped me keep reading but it was, although beautifully written, almost too much writing on the page. People who read this book will want less setting-up and more action. Atleast we see john grow as a person and make friends. My highlight was the epilogue, it was done in such a way, that the stories ending felt right. Not immediate in the time frame where John is 13, but in the future where they are all old enough to realize what they have to do.